At the start of the Tracey Hill Walking Trail in the town of Red Bay, Southern Labrador, a boardwalk and the first of 689 steps lead the way. The climb up the stairs will reach the final destination point at the top of Tracey Hill where the scenery is breathtaking. The trail is moderate on a degree of difficulty and runs for 1.5 kilometers, a return trip of 3. The average time along the boardwalk and stairs of the Tracey Hill Walking Trail is about 30 minutes, but many stop for breaks. Picnic tables, telescopes and a resting area makes the journey longer, but this is a day well spent while visiting Red Bay in Southern Labrador. Boardwalk and stairs at the start of the Tracey Hill Walking Trail in the town of Red Bay, Highway 510, Labrador Coastal Drive, Viking Trail, Trails to the Vikings, Strait of Belle Isle, Southern Labrador, Labrador, Canada. 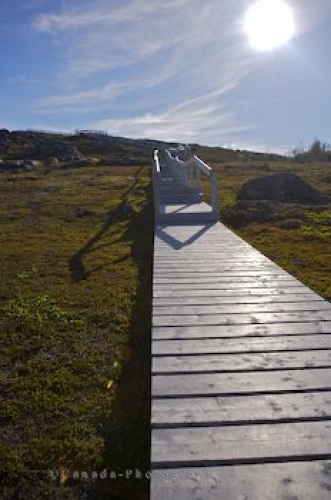 Picture of the boardwalk at the Tracey Hill Walking Trail in Red Bay, Southern Labrador.